Sangre de Cristo Seminary, located in the majestic mountains of South Central Colorado, teaches the principles of the Reformed faith; seeking to prepare students to enter Christian service as effective teachers and preachers of God’s Word. The school was incorporated in 1976 as a non-profit institution. First conceived and operated as a summer school, it was expanded in 1979 as a full seminary offering a Master of Divinity Degree. Due to the elevation (at nearly 9000 ft) the seminary has a somewhat unique schedule (June – December) compared to most traditional seminaries. The summer semesters are comprised of one or two week condensed courses focusing on theology, church history, and pastoral duties, while the fall term concentrates on the Biblical languages and exegesis. Because of our cool summers, Sangre de Cristo Seminary is able to attract some outstanding visiting professors who combine teaching with family vacations to teach our condensed courses. 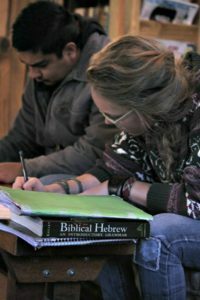 Our permanent faculty teaches the Biblical languages and exegetical courses during the fall, which follows a traditional semester structure. Visiting professors; giving students a breadth and diversity of exposure not normally found at schools this size. Low costs; enabling students to leave with little or no debt. Small and intimate; facilitating fellowship and one-on-one teacher to student interaction. Emphasis on Biblical languages (Hebrew and Greek); forming the basis for studies in systematic theology and exegetical analysis. Beautiful, majestic mountain setting; located in the Sangre de Cristo Mountains of Colorado. The purpose of Sangre de Cristo Seminary is to glorify God by preparing students to serve in various aspects of Christian service, with an emphasis on being effective teachers and preachers of God’s Word, with exegetical and communication skills. Sangre de Cristo Seminary seeks to identify promising students to prepare them for, and to entrust them to, effective ministry of the Word of God in the Kingdom of our Lord. The purpose of Sangre de Cristo Seminary (School for Biblical Studies) is to glorify God by preparing students to serve in various aspects of Christian service with an emphasis on being effective teachers and preachers of God’s Word with exegetical and communication skills. The Seminary offers the Master of Divinity Degree, Master of Arts in Exegetical Theology Degree and the Diploma in Biblical Studies. The Colorado Commission on Higher Education approves each of these programs. The Seminary is a member of the Association of Reformed Theological Seminaries (ARTS). Full Accreditation was first granted in November of 2003, and reaffirmed in October of 2018 with its third, ten-year full-accreditation. Additionally, Sangre de Cristo Seminary is approved by the Colorado State Approving Agency for Veterans’ benefits. Graduates of the Seminary have earned advanced standing for post-graduate studies in a number of seminaries and universities. Graduates have also qualified for service in the chaplaincy of the United States Armed forces.